A unique story about a business trip and competition that is filled with fun characters and humorous performances. Cedar Rapids is a unique comedy about something we haven’t really seen before. An overnight conference business getaway. 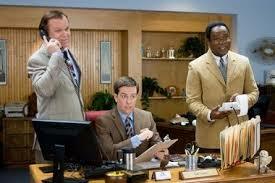 The movie is about the insurance industry and salesman. Not many comedies deal with work. They tend to feel like people are tired with their work lives and go to the movies to escape. The last thing they want to do is watch people doing the same job they do every day of the week. Movies like office space and more recently, TV shows like the office have started to prove that theory wrong. 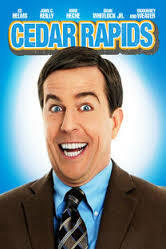 And who better to headline one of the first movies that cashes in on this new concept then one of the stars of the office, Ed Helms. For helms, like the office, this movie is smart comedic material. The casting is right on the money, getting some older actors like Sigourney weaver, Anne Heche, and the great John C. Reiley. All of these actors are incredibly talented, and Reiley in particular is the life of the party. He is absolutely hilarious here, as an almost Kramer-like character that says and does whatever he wants, no matter how untimely or inappropriate. But the Reiley character, Zeigler, also has a good heart, as can be seen by every situation where he helps his buddy Tim Lippe (Helms), out with a problem. Helms plays Lippe as a naive and innocent man with no real world experience. He lives in the same house he grew up in and is sleeping with his ex-elementary school teacher (Sigourney Weaver). He talks about how hot she was back when he was a student and how it’s all he thought about. And now, as an adult, he seems to think he’s in love with her. She, of course, has no interest in that word at all and is just having a good time. She tries to make this clear to him, but he just doesn’t seem to get it. The movie opens with a scene of the two of them in bed, and it’s an important scene for getting a quick intro to the Tim Lippe character. But right after that we are jetted off to the work place where the real movie will begin. Lippe works at brown star insurance, a mid west company that has won a prestigious award for the last two years back to back. The representative who goes out to these conferences, which are more like a competition, and comes back with the title every year is a bit of a big shot around the office. Only he dies. It’s sudden and unexpected and involves him being in a very uncomfortable and awkward position. Now the head boss of the insurance company, played by Stephen Root, asks Lippe to attend the conference in this representative’s place. That’s the setup. It’s a solid premise because he’s never even left the state before and now he’s thrust into a competition where his company has won every year, and he’s got a record to maintain. And just watching Tim leave the country and board a plane, or enter a hotel and then a hotel room, is all a lot of fun. When he gets to his hotel room, Tim is on the phone and a black man answers the door. Tim’s reaction is absolutely hilarious. The black man turns out to be one of his roommates in the hotel suite. The other roommate is Ziegler, a man who Stephen Root warned Lippe all about. He was told to stay as far away from this guy as possible, and now Zeigler is staying in the same room with him. Lippe also meets Joan, played by Anne Heche, who is just one of the boys, friends with all of them and into the same kind of humor. When he meets her for the first time at the hotel gym, she accuses him of being a pervert, says she’s going to report him, and then reveals that she’s just messing around with him. Aside from this unlikely bunch of characters, Tim also befriends a prostitute who stands outside his hotel. It takes Tim a couple of times of seeing her to catch on that’s she’s a prostitute, and by the time he does catch on, he’s already developed a repose with her. Later on in the film, Tim goes on a self-destructive rampage that leads him to go out to a party with this girl and get himself into a lot of trouble. For three quarters of this movie, everything works smoothly. The mission isn’t given much attention, and instead the focus is more on having fun and finding creative scenes to put these characters into. But then suddenly the movie readjusts itself and gets back on track to be about the competition. Secrets are uncovered, and all of a sudden we have a movie about the little guy taking on the big, evil corporation. This becomes a movie about corruption, and it feels all too clichéd. Especially considering what it was about up until this point. As the movie gets closer and closer to it’s conclusion things start to get too neatly packaged up. We get too villains and a preachy kind of statement about doing what’s right. I guess the movie needed to go somewhere and couldn’t be about friends at a hotel just having fun for it’s entirety. But those scenes were certainly the best, and by the ending becoming the same as every other movie, it’s a little like this movie is selling out. It’s a very good movie, smart and funny, but by the end it becomes just like everything else we’ve seen before.